All Green is a certified e-waste recycling solution provider that offers world-class Electronics Recycling and IT Asset Disposition Programs in Sacramento County, California. We have a reliable Electronics Recycling Program which will work to provide ease and convenience for you. Are you looking for the best ITAD Solution provider in Sacramento County? Choose All Green Recycling now. The destruction of sensitive files and information is one effective process for you to avoid data hacking. All recalled, defective, and EOL IT equipment should be destroyed to protect your brand from data breaches. The areas cited below are the points of concentration of All Green’s Electronics Recycling Sacramento County Services. We designed our services for the purpose of promoting e-waste free landfills. Sacramento County is located in the Sacramento Valley of the Central Valley, California. About 348,432 residents are living in seven incorporated cities. 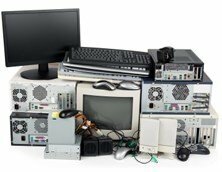 Check out the link button given below for you to schedule an e-waste pickup today. Recycling electronic products is a present trend because of the negative impacts of hazardous materials found in e-waste. There are cadmium, barium, copper, iron, zinc, nickel, mercury, and other metals in old computer devices and the like. Depositing them in the landfills is not allowed. That’s why there are already laws and regulations that are mandated, prohibiting the dumping of electronic junks not only in this country but the whole wide world as well. As we work together to have a sustainable environment, adopting our IT Asset Management is one good option. With All Green Recycling, you can have the assurance that all your e-waste issues will accordingly be addressed. Computer units (desktops, laptops, and other computer-operated gadgets) can operate for your business from 18 to 24 months according to statistical data. With this short period, every business organization has to replace their computer facilities and equipment. Otherwise, they’ll be left behind, and their operation will be compromised. Despite this necessity, addressing the issues associated with computer accumulation should be given utmost importance. Recycling old laptops and other computer devices is therefore needed. Aside from it, every operator or owner can also remarket the IT equipment at a higher resale value through All Green’s IT Asset Remarketing. Brand protection is a crucial thing to consider if you want your business to succeed. But the threat of data breaches is among the woes that must be addressed well. All Green has crafted a solution for this particular problem. Destroying the hard drives, SSDs, servers and other digital data portals is embedded in the Data Security and Hard Drive Shredding Process which we brilliantly created. No single data and information that are confidential should leak. This goal is possible and realistic through the recently mentioned service that we have made available to you. Through our Electronics Recycling Sacramento County Services, all your end-of-life computers, cellular phones, and other tech products will be treated, processed, and refurbished in our premium-class facilities. We can work together for the betterment of this planet. Sustainability is one big factor why we’re pushing hard our services and why we’re committed to exert effort painstakingly just to let everyone know the importance of proper e-waste disposal. If you’re therefore looking for the best e-waste recycling solution provider in Sacramento County, All Green could be a top choice today. Contact us now for more details and information.